Let me tell you a little story, about a girl with blonde curly hair, who had a mother with brown straight hair. I know my mother doesn't read this since she's still not sure what a blog is, but if she did she'd say, I do too have curly hair! Erroneous. A person who has never had curly hair doesn't understand the following: DON'T EVER BRUSH IT. WHEN IT'S WET OR DRY, JUST DON'T DO IT. Why not? You end up with the result below. 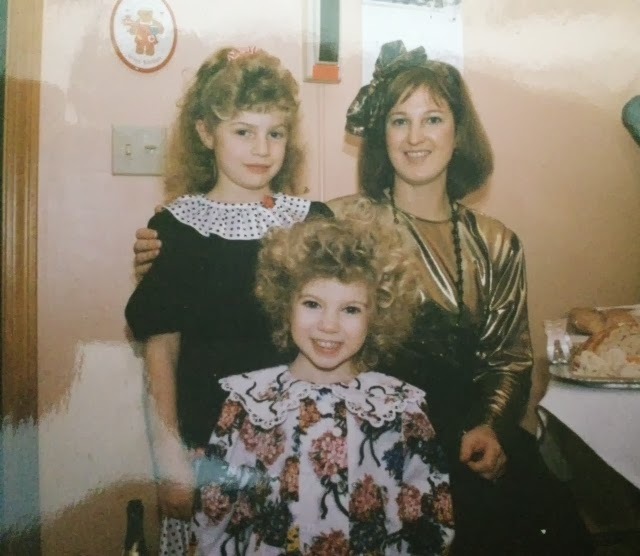 I'm the super-thrilled looking tyke on the left. My sister, totally oblivious in her youth, is absolutely adorable, no? I'll spout this to anyone, she was the cutest little kiddo I've ever met. So my mother used to line us up on the stairs in the morning before school and tear through our mops with a fat brush. My sister and I would cry as she worked through the tangles and we'd end up with a triangular fro. The picture above is actually pretty tame. All of my friends had long, straight hair, but I wasn't so acutely aware of my frizz until a peer in my sixth grade homeroom took it upon himself to make up little raps about my hair while the teacher was out of the room. It was not a good time for me, though I thankfully never cried in class, and the teacher once pulled me aside and told me (I don't know how he knew) that if I wanted to wallop the kid he would look the other way. I'm not a violent person so obviously I didn't take him up on his offer. But after that year I started wearing my hair in a very tight bun. It wasn't until my freshman year of college, when I had a roommate with very curly hair, that I started to learn how to properly take care of it. I learned about hair products and drying techniques and I started to love my hair for the first time. I've never wanted straight hair again. But I've never had a good haircut, which might be why I only go once every 2 years. This past weekend I finally went to a good hair stylist. What makes her good? She has curly hair. She gets it. And when she diffused my hair... I hadn't seen it that curly in a long time. My hair changes from wavy to ringlets depending upon how I let it dry. I walked out of the salon feeling amazing. Thank you to this website for helping me find a great place to get my hair did. Also, I really just wanted to share that adorable picture of my sister. Don't you just want to pinch her cheeks?